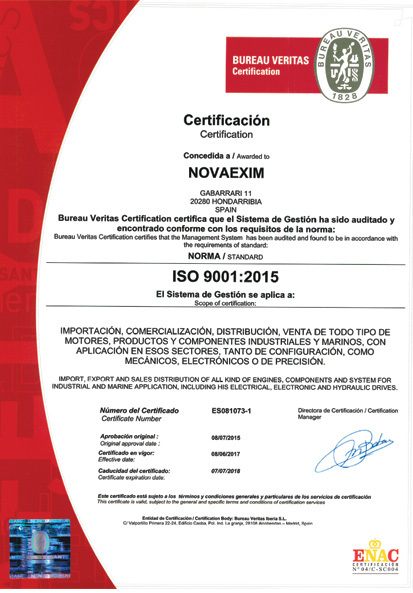 NOVAEXIM has a quality management system in place, developed according to ISO 9001: 2015 and certified by Bureau Veritas. The professionalism and qualifications of those working in our company. The incorporation of new technologies applicable to the products and services we offer. Respect for society and the environment. The identification of the necessities and the expectations of the interested parties in our company. The identification of the risks and opportunities, and the implementation of actions to reduce the risks and to take advantage of the opportunities. The permanent improvement of the quality of our products and services we provide to our customers. Adapting to customer requirements, so that NOVAEXIM can be perceived as a flexible and efficient organisation. Achieving full customer satisfaction, in order to secure long-term business relationships. We respond promptly to the various demands of our customers, on time and with the highest quality, and are committed to each project and intervention. We want to share with customers our passion for the equipment supplied, ensuring its functionality, and meeting the highest standards of quality and reliability. Finally, we would like to state that our activities will be carried out with respect for the natural environment and sustainable development, which is increasingly seen as a global demand by society, and is inseparable from the ideas of progress and the future of our organization. We are in a process of expanding the scope of our certification to include the management of the activities in our own workshop and of the test benches.